Salk researchers discover how oxygen-deprived tumors survive body’s immune response. The immune system automatically destroys dysfunctional cells such as cancer cells, but cancerous tumors often survive nonetheless. A new study by Salk scientists shows one method by which fast-growing tumors evade anti-tumor immunity. The Salk team uncovered two gene-regulating molecules that alter cell signaling within tumor cells to survive and subvert the body’s normal immune response, according to a September 18, 2017, paper in Nature Cell Biology. The discovery could one day point to a new target for cancer treatment in various types of cancer. Cancerous tumors often grow so fast that they use up their available blood supply, creating a low-oxygen environment called hypoxia. Cells normally start to self-destruct under hypoxia, but in some tumors, the microenvironment surrounding hypoxic tumor tissue has been found to help shield the tumor. “Our findings actually indicate how cancer cells respond to a changing microenvironment and suppress anti-tumor immunity through intrinsic signaling,” says Izpisua Belmonte. The answer was through microRNAs. MicroRNAs—small, noncoding RNA molecules that regulate genes by silencing RNA—have increasingly been implicated in tumor survival and progression. To better understand the connection between microRNAs and tumor survival, the researchers screened different tumor types for altered levels of microRNAs. They identified two microRNAs—miR25 and miR93—whose levels increased in hypoxic tumors. The team then measured levels of those two microRNAs in the tumors of 148 cancer patients and found that tumors with high levels of miR25 and miR93 led to a worse prognosis in patients compared to tumors with lower levels. The reverse was true for another molecule called cGAS: the lower the level of cGAS in a tumor, the worse the prognosis for the patient. Previous research has shown that cGAS acts as an alarm for the immune system by detecting mitochondrial DNA floating around the cell—a sign of tissue damage—and activating the body’s immune response. “Given these results, we wondered if these two microRNA molecules, miR25 and miR93, could be lowering cGAS levels to create a protective immunity shield for the tumor,” says Min-Zu (Michael) Wu, first author of the paper and formerly a research associate in Salk’s Gene Expression Laboratory, now at Amgen. That is exactly what the team confirmed with further experiments. Using mouse models and tissue samples, the researchers found that a low-oxygen (hypoxia) state triggered miR25 and miR93 to set off a chain of cell signaling that ultimately lowered cGAS levels. If the researchers inhibited miR25 and miR93 in tumor cells, then cGAS levels remained high in low-oxygen (hypoxic) tumors. 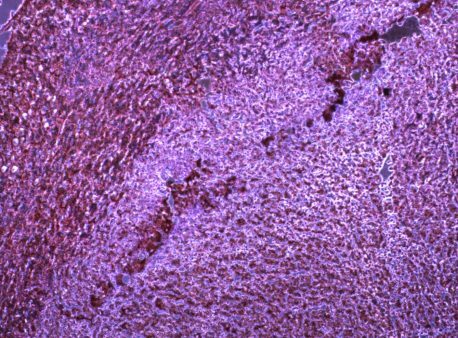 Researchers could slow tumor growth in mice if they inhibited miR25 and miR93. Yet, in immune-deficient mice, the effect of inhibiting miR25 and miR93 was diminished, further indicating that miR25 and miR93 help promote tumor growth by influencing the immune system. Identifying miR25 and miR93 may help researchers pinpoint a good target to try to boost cGAS levels and block tumor evasion of the immune response. However, the team says directly targeting microRNA in treatment can be tricky. Targeting the intermediate players in the signaling between the two microRNAs and cGAS may be easier. “To follow up this study, we’re now investigating the different immune cells that can contribute to cancer anti-tumor immunity,” adds Wu. Other authors on the paper include Carolyn O’Connor, Wen-Wei Tsai, and Lorena Martin of Salk; Wei-Chung Cheng, Su-Feng Chen and Kou-Juey Wu of the China Medical University, Taichung, Taiwan; Shin Nieh, Chia-Lin Liu, and Yaoh-Shiang Lin of the National Defense Medical Center, Taipei, Taiwan; and Cheng-Jang Wu and Li-Fan Lu of the University of California, San Diego. Funding was provided by the Razavi Newman Integrative Genomics and Bioinformatics Core Facility, the National Institutes of Health and National Cancer Institute, the Chapman Foundation and the Helmsley Charitable Trust, the G. Harold and Leila Y. Mathers Charitable Foundation, The Leona M. and Harry B. Helmsley Charitable Trust, The Moxie Foundation and UCAM.